This is my very first post on a blog. Ever! Ahh, the excitement! I am more and more concerned with the kinds of foods that I am putting into my body. I’m learning about GMOs, the benefits of eating organic and other hidden junk that manufacturers put into their food. I will keep posting about my findings and hopefully will help you make better choices in the kitchen. First up! 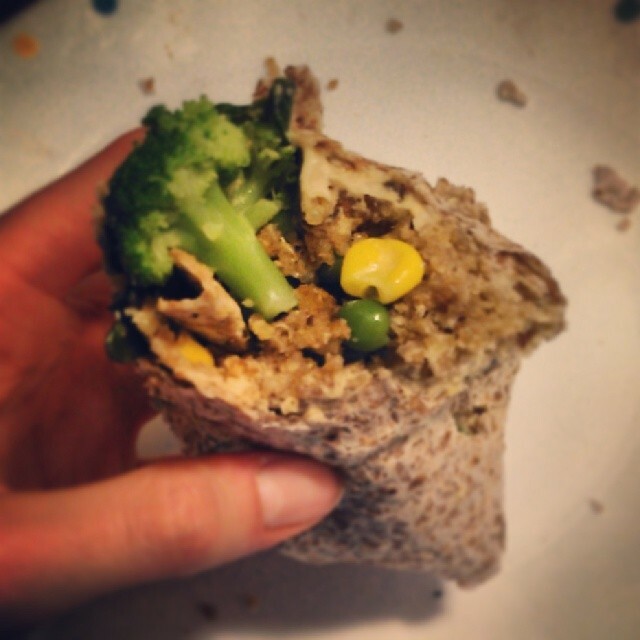 My yummy delicious WARM veggie wrap. While my Hilary’s Eat Well adzuki bean burger toasted up in my toaster oven I warmed up an Ezekiel 4:9 tortilla in the microwave for twenty seconds and I boiled some organic peas, corn and broccoli. On my tortilla I spread on some regular hummus, added some organic kale, the vegetable medley and broke up the veggie burger into pieces. Then, I rolled it up very carefully and was barely able to get a picture of it before it was devoured. *note: The tortilla isn’t as pliable as a regular four tortilla, so you might get a little messy. But, it’s so worth it! Also, try it with sweet potato as your veggie, some roasted red pepper hummus or add some quinoa for added protein. Sounds delicious! Welcome to the blogging world! Oh, awesome! I have been eating on a vegan diet for about two weeks now. I won’t always post vegan recipes, but I will do my best to do lots of them for you. I accept this challenge!